The first thing I noticed when we got to Williamsburg was how many hipsters there were. And these just weren’t any kind of hipsters. They were proper hipsters; or in other words douchebags. For instance, there was a guy wearing Buddy Holly glasses. Fine, you say, nothing wrong with that. Oh yeah? There were no lenses in the glasses. Yeah, I know, go fug yourself. 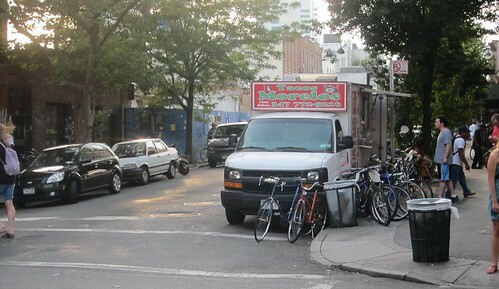 The first truck we tried was Tacos Morelos. I ordered cesina (salted beef) and bistek. The tacos were pretty big and came folded into paper plates. 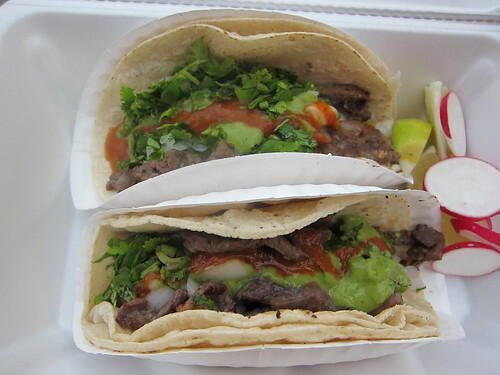 Each taco also came topped with a mild salsa roja and an avocado salsa. Neither salsa had much flavor. Neither taco had much flavor. I couldn’t tell which meat was which; both were salty, fatty, and chewy. I probably should have gone with more variety, maybe pork or chorizo but I doubt it would have mattered. The tortillas(dry)and salsas didn't do much for me. I'll pay $2.50 for a taco but I expect more when I do. 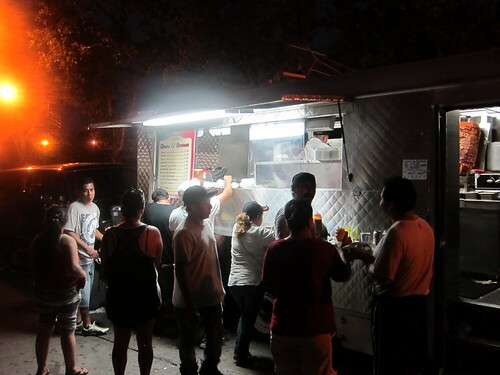 We got back on the subway and made our way to Sunset Park to a truck called Tacos El Bronco. Once off the subway we didn’t really know which way to go. We ended up walking the wrong way for about 30 minutes. It was night time by now but still hot and humid. Eventually we found El Bronco at the top of 4th Ave and 44th street. 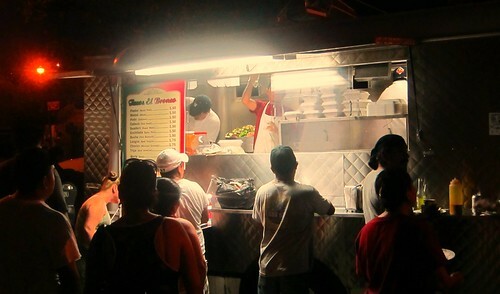 It was a popular scene with two workers taking orders outside the truck and four workers inside the truck. I can only imagine how hot it was inside the truck as it was miserable outside of it. 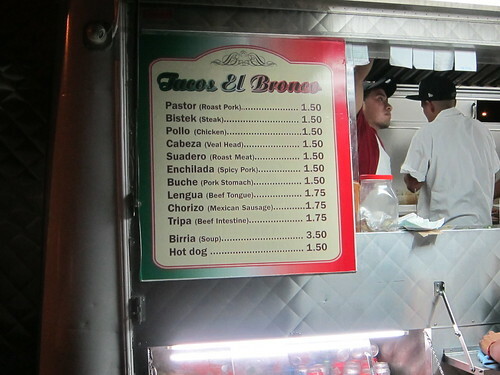 They also had an al pastor spit inside the truck, which I hadn’t seen except for Tacos Mix. I ordered al pastor, bistek, and lengua and popped open a bottle of pineapple jarritos. About ten minutes later I heard my number called. My plate came topped with a grilled green onion, cucumbers, limes, and radishes. They had three squeeze bottles of salsas on the counter: avocado, salsa chile arbol, salsa roja. I dug in and it was like being back in LA. 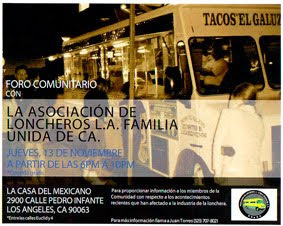 The tacos were greasy and delicious. Everything was on point; the tortillas were oiled just right, the bistek was finely chopped with good flavor and no fatty bits, the al pastor was tender with charred bits of pork mixed in, and the lengua was soft with a peppery flavor. 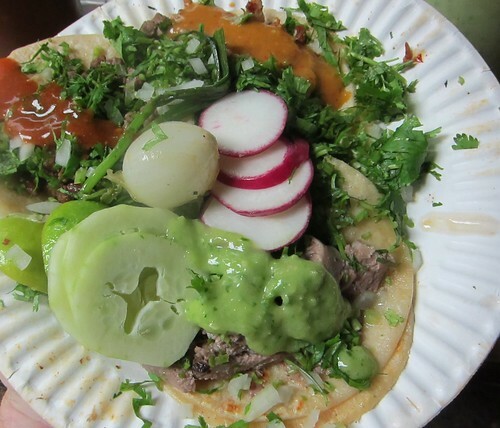 At $1.50 each these tacos are a steal by NYC standards. By the time we got back to the subway we were beat. We scratched the plan to head to Queens. A cold shower sounded better than another taco. 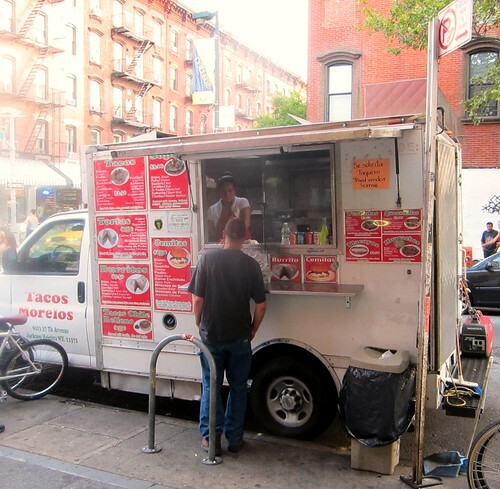 The heat had gotten the best of this taco reporter and my time in NYC was coming to an end. Wow, it all looks for good and fresh.